Being a girl that was born in Pennsylvania, and brought up in Ohio, my Mom always fixed pork and sauerkraut for New Year's Day. This year I changed it up and fixed a pot of Black-Eyed Pea with Sausage Soup to bring in the New Year. I'm using a favorite Winter teacup that's marked Clarence, Bone China, Made in England. 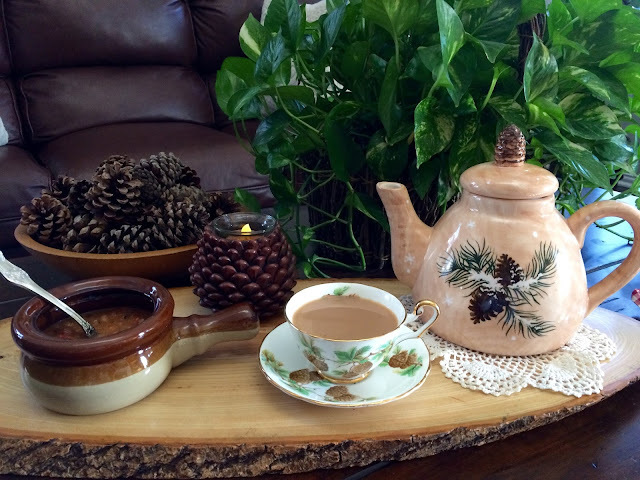 I love the pine cone spray inside the teacup. 1. In a large dutch oven, brown the sausage. 2. Add the onion, bell pepper, garlic and jalapeño to the dutch oven and cook over moderate heat, stirring, until just beginning to brown, about 6 minutes. Add the tomatoes, the black-eyed peas, along with the broth. Season lightly with salt and pepper and bring to a boil. Cover partially and simmer until the soup is heated through. 3.Add the chopped cilantro, season with salt and pepper and simmer the stew for a few minutes. Spoon the pea-and-sausage soup into deep bowls, garnish with cilantro leaves and serve. Recently I won a ThermoWorks Chef Alarm, which was coordinated by Jean's blog at Delightful Repast. 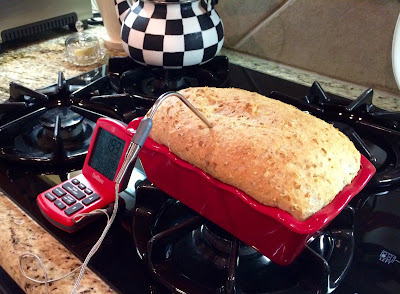 This probe can be used for so many things, one of which I used for my Civil War Starter Bread, to make sure that reached the proper temperature. As you can see, Jean even asked what color I would like to pick for my Chef Alarm, and of course, I picked red! 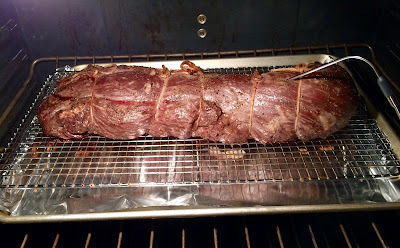 Once a year, I splurge on a beef tenderloin for Christmas Eve, in honor of my late Beloved Husband, who loved to have it for our family's Christmas Eve meal. The probe was used for this, to make sure that it reached the perfect temperature. Thank you so much to ThermoWorks for this Chef Alarm, and to Jean, who reviews these fabulous products and coordinates it all. I know I'll be using it to check the temperature of so many things. Pope Francis has declared this the Year of Mercy, and I had been learning about mercy this Advent season. I pray for God's Mercy for each of you and may you bring God's love and mercy to everyone you meet. Mercy is a gift that you can give and receive. I pray, also, for peace in the world, in my home and yours, and peace in myself and for all of you. Amen. Happy New Year to all my friends. Thank you for all your thoughtfulness and kindness that you've shown me throughout the year. You mean the world to me. Well if you saw my last post, Kitty you will see I, too, was honored by an arrangement to win a most perfect giveaway from the very same Jean of Delightful Repast blog! She is amazing, yes? Your recipe for that soup sounds perfect - comfort food on a cold winter's day! YUM! Yum! The soup looks amazing! I know there are traditional New Year's foods, but my family never really followed any of the traditions. I will have to make this for New Year's Day next year and probably a few times before that too! The bread and tenderloin look amazing too! Happy New Year, Kitty! Though not from the South, I love black-eyed peas, and am anxious to make your soup recipe. It sounds delicious and perfect for a winter meal. In times past, I've prepared black-eyed peas on New Year's Day for good luck. One of my sons, who won't even give black-eyed peas a try, said he'd take his chances! ;-) What a BEAUTIFUL prayer you wrote for your family about mercy and peace. Black eyed peas is a dish I have never had...I guess from being of Brit stock from the west coast, but it sounds delicious! I love your pinecone teacup! And congratulations on your win! Thanks so much for linking to Tuesday Cuppa Tea! My eyes went like a magnet to that bread. It must be winter. Bread is so satisfying this time of year. I am so glad you won the Give Away. I am loving your posting today and the "comfort" it brings! We had Black Eyed Peas recently too! Kitty, your bread looks delicious and on a cold winter's day, so very satisfying! Do you know I have never had black eyed peas? I have wondered what they taste like. Your soup sounds warm and comforting as all good soups should. You are such a good cook and I can't think of anyone more deserving to win the ThermoWorks probe! You will put it to good use, I know. I love your pinecone teacup and teapot. Happy New Year to you and all your loved ones and thank you for your sweet comment on my blog today! Well, my hubby would sure like this soup - sausage in anything and he's all for it. It's certainly my idea of a hearty meal, homemade soup and a crusty loaf of bread - enjoy the fruits of your labour Kitty. The probe looks like quite a useful kitchen tool and you're the perfect person to have one of these gadgets. I went to a kitchen store today to buy a new peeler and there are so many types now, just like everything else. The family prayer you wrote is lovely. Kitty, I see you put the prize to good use! I love doing giveaways, especially when a really sweet person like you wins! Of course, I think most of my readers are sweet! Mercy, love and peace -- something we all need to cultivate and spread. Wishing you a wonderful 2016. Your soup sounds delicious...I am sure that I could make it to suit our bland tastes. Ha! What a wonderful gadget you won. My son has one and nearly drives me bonkers with his poking my Thanksgiving turkey. He says, "How do you know that it's done?" I say, "Because it has been baking for 19 hours!" LOL Okay, for most things I am sure that it comes in very handy. A blessed New Year to you, Kitty, may you see the desires of your heart. Your civil war starter bread sure looks wonderful. Is that a recipe you have shared before? What a beautiful heart felt prayer you shared with your family on Christmas. The Lord will use it in the hearts of those who heard it, you can be sure of that. I thought of you often today and said a prayer for you, dear friend. Black-eyed peas are a New Year's tradition that I just got in on! My husband would love your hearty soup, and I would love that homemade bread! Mmmm . . . yummy! That temperature probe was a great win. A lovely prayer, I'm sure your family appreciate it. Dear Kitty, Happy New Year sweet friend. Love your pretty teapot and cup. So perfect for the cold winter days. Your photo is beautiful. Oh the soup looks so good and what a great recipe. Thank you for sharing it. I also made a dish using blackeyed peas and sausage. It is our tradition for new years. Congrats on your wonderful win. I know you will get great use for so many things. Love the red color too. Perfect for making your Civil War bread. Wishing you a wonderful year ahead filled with many blessings. I gotta feeling that tonight's gonna be a good night! So now I get where the Black Eyed Peas drew their inspiration for their name. Hee! Thank you for also sharing the lovely prayer. The quality of mercy is not strained...I need to work on that this year! Hello Kitty, Happy New Year. Your prayer is so lovely. Thank you for sharing it. I think mercy is just what we all need. What a great word for the Pope to choose. Your BEP with sausage sound delicious. I love BEP. Your tea cup is one of my favorites. So lovely! I am wishing for you the best possible in 2016. Your soup sounds delish! Yes, I would add the jalapeno ~ :) Please tell me about the bread ~ sounds very interesting and looks delish! Your tea setting looks so pretty. You have such a beautiful collection of tea cups and saucers. Your prayer is beautiful! Thanks so much for sharing it. Let's hope that this year is the beginning of much better times for us! PS I love the prayer you wrote! Happy New Year Kitty! With our unusually freezing weather, I've been on a soup marathon recently. I'll have to add this one to my recipe collection. I also have never eaten black eyed peas before. On another note, thank you for sharing your prayer with us. So meaningful that you wrote it. Praying we see more peace and mercy in 2016. Happy New Year. Your soup looks so good and perfect for the winter months. Congrats on you win too. 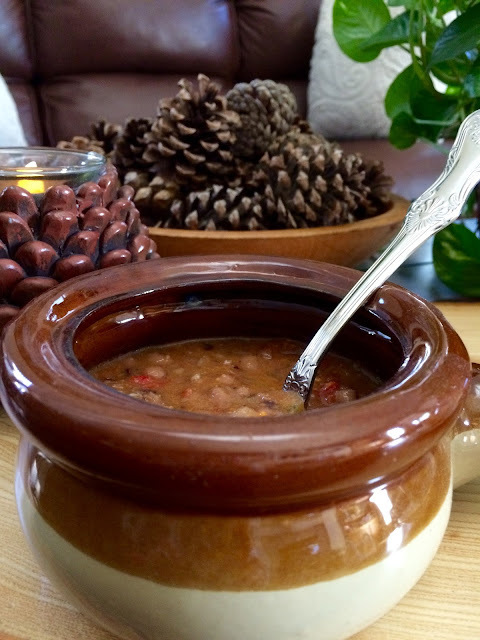 Thanks for sharing this at Cooking and Crafting with J & J.
Wintertime and soup go together. We eat it often. Just finished our Christmas "hambone" by making some bean soup. Love to use sausage in soup too. Even though I live in Pennsylvania I don't care for sauerkraut, however regular cooked cabbage is a favorite. 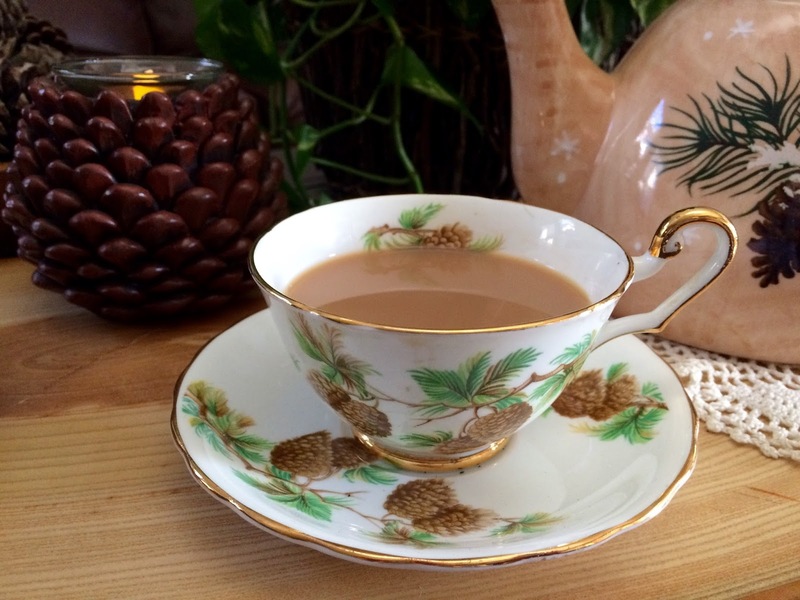 What a pretty tea cup with the pine cone and tassel. Did you know that is the "state flower" of Maine! Happy New Year! love that probe...must ck that out..
and i love your pretty prayer. Hi Kitty! Happy New Year to you! Your teacup is so pretty and the soup sounds so good! I will make it soon. Perfect for our cold winter! Also I love your family prayer! Kitty, your New Year's welcome and prayer are a good way to begin 2016. We always eat blackeyed pea soup to bring in the new year. I agree, your pretty teacup is the perfect dish to enjoy your peas. Congratulations on the win. Looks like a very useful kitchen tool. All the best for a wonderful year. What a beautiful prayer - thank you for sharing it. Happy New Year! I just wanted to stop by to let you know I have been enjoying some Christmas tea in the tea cup you gave me from the teacup exchange! I know it tastes better because of the cup! ;0). Thank you!!!!!! I always dread the New Year's black eyed peas Kitty, but in a tasty soup with sausage, I might just be able to manage! Congrats on the cool thermometer! Kitty, I have never made black eyes peas before. This looks so yummy! I can't wait to try it. The bread looks delish as well, and that thermometer is so cool. Of course, it needed to be red! Loved your sweet prayer you wrote for your family! Thanks for sharing with SYC. Congratualtions on winning, dear friend. The thermometer couldn't have gone to a more perfect person as I know you will put it to good use. Enjoy your weekend. Much love to you! What a great post! I got a recipe and an idea for a gift for my husband. 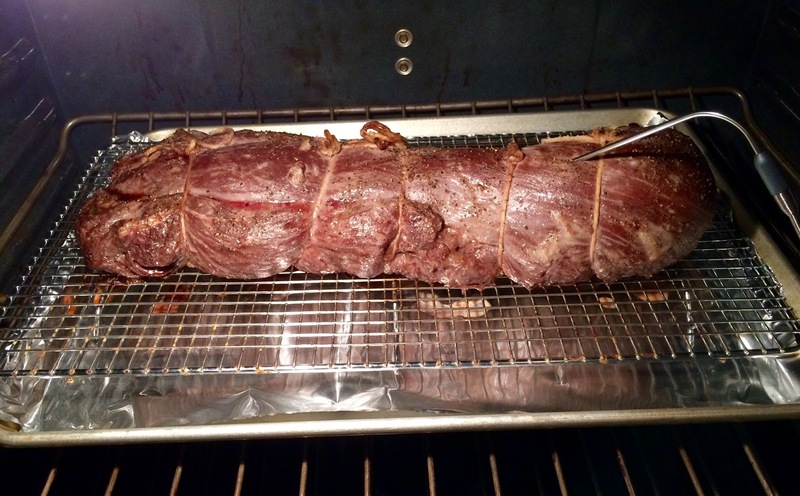 Steve was making prime rib the other night and his meat thermometer died. We borrowed our neighbor's, but he is looking for a new one. I'm sharing the recipe with him because this is the season of soups at our house. We always had pork on New Years too! Lovely prayer. Hope all is well with you, happy 2016! Oh Kitty, what a lovely post! The soup sounds delicious and so comforting! Have a good week my friend! What a beautiful prayer, we could sure have used that prayer in our family this year or every year for that fact. Of course we love Black Eyed Peas but with this 20 degree weather, a hot bowl of that soup sure looks good! Thank you so much for sharing with us at Full Plate Thursday and have a great day!